Are you 18-35 years old? Do you want join AEGEE and apply to all the local and european events? Beeing part of AEGEE-Bergamo, you can go to the Summer Universities, all the international events organized by members of the associations all over europe and take part to the Tandem Bergamo project. Moreover you can also come to all the activities organized by our “Antenna” (trips, parties, conferences, language exchange…) and take advantage of the benefits of the card! Firstly fill this module, someone will contact you as soon as possible and invite you to a meeting. Come to a meeting and collect your membership card. 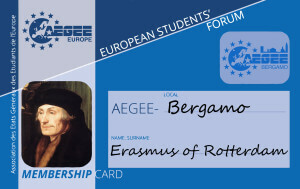 Subscribe to Aegee Europe at www.aegee.org using the code you will find on your membership card. To participate actively at the AEGEE Network events you have to subscrive and obtain a membership card. The cost of the card is 20€ and lasts one year.